Reminder: Leinster Champs Entries close at Midnight on Sunday! Our annual beginners event in Donadea Forest Park takes place this coming Sunday 27th January, with starts available from 11am to 1am. We hope to have the entrance barrier raised from 10:30am to 12:30am to facilitate free entry to the park for the event. If you are planning on bringing a group, it would be useful to contact us ahead of time, so we can ensure we print enough maps, etc. There will be refreshments after the finish, and in an effort to save on waste plastic, we'd encourage everyone to bring their own cups for refreshments afterwards. We'll also accept plastic map bags back for future re-use. The event registration and parking is based at the DFTC Sports Grounds, with the start and finish close by. Start times from 11:00 to 13:00, with all course closing at 15:00. There's the full range of courses on offer - at the high end, they might seem a bit longer than usual, but the running is generally flat and good, and the distances reflect this. Control descriptions are on the map for Yellow-Green, but there wasn't enough space on the Blue and Brown maps - they are available loose for every course anyways. In an effort to save on waste plastic, we'd encourage everyone to bring their own cups for refreshments afterwards. We'll also accept plastic map bags back for future re-use. The Summer Series winds to a close with our annual Score event in Hollywood next Tuesday. This will be followed by a BBQ in the village, and the prizegiving for the series. Don also mentions that a new Café has recently opened in Hollywood. Well worth a visit to charge up on homemade carrot cake or big furry scones before your run. Closes at 18.00 ish . * Adventure Course - 2.7km, 100m climb. It is on tracks and forest paths, not difficult terrain but definitely not suitable for buggies, or bare legs. * Score Course - collect as many controls as possible in any order within a 50 min time limit, with 10 points penalty per minute late. Full leg cover is very strongly advised. The final points-scoring race of this years series takes place around the schools, parks and estates of Newbridge, Co. Kildare. A maze of roads, walls and buildings will demand good map reading skills at high speed if you want to earn those vital last league points! 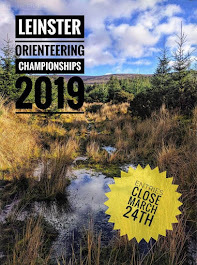 This event is also being run as part of the Newbridge Junefest, so we expect higher-than-normal numbers of new orienteers to turning up to have a go! Car parking & Registration is in St. Conleths & Marys primary school car park, opposite St. Conleths Parish church in Newbridge. These are sprint format races - sprint rules apply - uncrossable boundaries and out-of-bounds areas must be respected or competitors risk disqualification. Since the series has four scoring events this year, your best three results will count towards league placings. Similarly, juniors who take part in any three events will get a small token at the prizegiving following the last event on 19th June.